fair, responsible and people-focused savings and loans. Whatever you’re saving for, our flexible approach lets you save what you want when you want. Plus by saving with us, you’ll get a better rate of interest if you need a loan. No set up costs, no early repayment penalties and no hidden charges or small print. If you borrow from us, you’ll know exactly how much you’ll pay and for how long. The Engage Pre-paid Visa Debit card lets your savings be used to pay household bills, meet domestic needs, and whenever you have to pay by card. 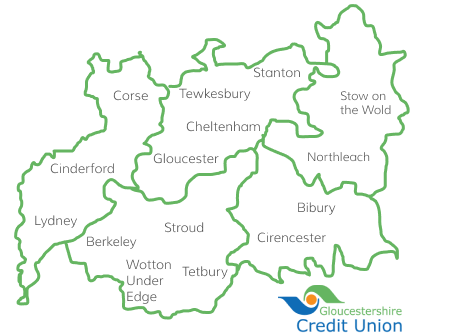 Gloucestershire Credit Union is a financial co-operative owned by everyone who holds a savings account or a loan with us (called members). They each have a share of the profit the credit union makes each year plus a say in how the organisation is run. By saving or borrowing with us, your money will also be doing good at the same time by helping other people within Gloucestershire’s communities. Gloucestershire Credit Union offers a responsible, reliable financial alternative to the high street banks and other financial companies. Your savings with us are protected by the Financial Services’ Compensation Scheme giving you peace of mind that your money is safe. We’re managed by a Board of Directors who keep tight control of our operations, ensuring that your money is well managed. Credit Unions’ approach to finance is over 150 years old but it has stood the test of time. They began in Germany in the 1850s and have since spread all over the world: Gloucestershire Credit Union is one of over 57,400 credit unions operating in more than 115 countries including Australia, America, the Dominican Republic and the Seychelles. "We could make this a different, much fairer country"
We have a range of loan options for both new and existing members so we can find the one that best meets your needs. Apply online for a loan, download an application form or ring 01452 422712.